‘Downsizing’ - one of these post-modern words with undeniably horrible connotations, and which can include situations where people are given incentives to take early retirement. It usually happens to businesses – now it also seems to happen to ordinary folk living in large houses. But is this just another inevitable step along the trajectory towards death? I quipped considering the move, that it would be the last before the nursing home or the graveyard. We went from a McMansion in the West to a rambling house in the hills – and now a small bungalow in the more suburban part of the hills called Emerald, which has its special charms, among which is the Puffing Billy steam railway. 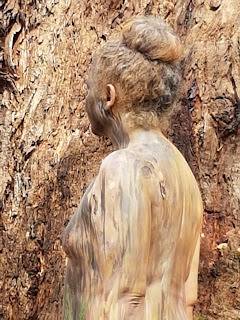 The hardest thing was packing up my studio… No, that’s not entirely true, as the hardest thing was saying goodbye to Granddad tree, which included a ‘merging’ by shaman and body artist Orly Faya. 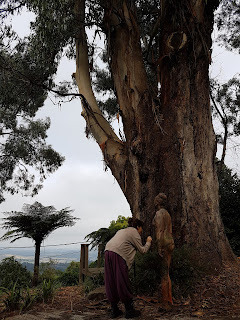 This was a non-negotiable condition that I placed on moving, as I feel true kinship with this mountain eucalypt. It is like an ancestor that has taught me much about belonging. 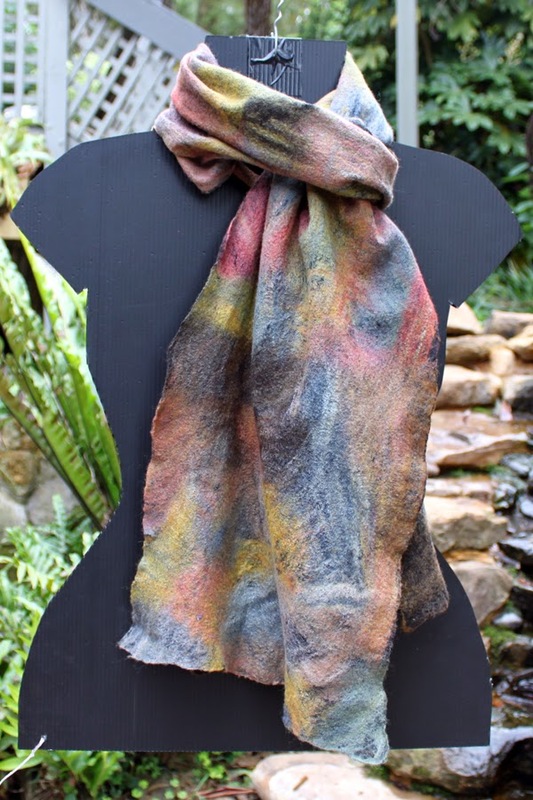 On the last day, when I said goodbye to the house in Ferny Creek and noted aloud to it all the things which had required my time and energy – how I chose this paint colour, how I sewed these curtains, how Philip and I laid these floor boards…it was in thanksgiving. It was to say how much I loved living here and what time and effort had gone into making it a home, as well as with what sadness it was to leave. We’ve gone from a house where we had 7 sofas (we weren’t counting but was alerted to the fact by a visitor) to a house where can barely fit two in the lounge room. But in the scheme of things sofas don’t count. I miss my studio. While I packed I had it in mind to re-create something much like I had at Ferny Creek but perhaps this will not be possible. I feel as this relocation has taken up the bulk of the year – you don’t just put your house on the market, you put your life on hold, as well. I’m still unable to unpack my studio and it doesn’t seem that the situation will right itself for some time. Now getting used to the new surroundings. The chooks seem to like their ‘cubby house’, which is very spacious. Albeit I’ve noticed Maudie dog and Bud cat rather melancholic. Are they too missing the studio views onto the garden? Maudie hasn’t a door of her own to slip in and out as she wishes. Bud’s outdoor activities have been curtailed, as he’s not allowed to go out at all but must amuse himself as an indoor cat. 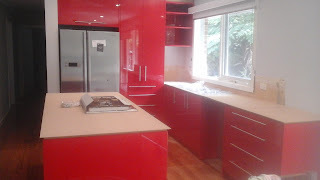 Our experience of things in the new house will become what they are to us, when we see them together with the colour red, because red is a colour that boldly announces to you that it is there. It warms and delights. Back at the new place, in the shed among other paint cans and turps, I came across some Annie Sloane chalk paint and sealing wax, which the previous owner kindly left behind. I didn't pay attention at first, but one day I woke up and thought 'ah chalk paint, I must find out what that stuff is'. Admittedly, such sad colours (hardly colour at all) such as ‘Paris Grey’ and ‘Old White’, but still colours which I can utilize to familiarize myself with a new hobby of painting furniture. Chalk paint doesn't require sanding or stripping back the old varnish or paint - you can just slap it on right over the old layer. Just my sort of paint. The hard work of stripping back the varnish on the bench top in the kitchen at Ferny Creek to make it more appealing before the sale, was enough to have put me off 'restoration' for life. And yet here I am with lights in my eyes, contemplating painting furniture. Thanks and gratitude to Danuta Ephemeralart for the support and photos taken during the Granddad merge. Just found your blog by way of youtube. This touched me deeply since I, too, have a tree, Helen, on my property. I could never bear to part with these five acres, which would surely be my death on this earth. Blessings on your new spaces. Thanks for reading and leaving a comment Sandra. I’m awed that you have named ‘your’ tree Helen. I’ve known several trees that have left their mark on me, yet never named them beyond feeling this is a parent, or this forest is a cathedral in which I can worship. Your Helen seems more intimately known and loved. In the new place, there is a very different tree being – a beautiful elegant Japanese Maple, which seems to form the centre piece of the backyard. She’s poised and stretches gracefully in her canopy – a different being to the old, gnarled, and tenacious Granddad I knew in the old place. The garden is stepped and ‘she’ is on the top with dominion over the whole place, including the house. I can see her from the kitchen and dining room, whereas, a view to Granddad was restricted from the house.